Dimensions (HxWxD): 1" x 0.45" x 0.375"
This stunning deep violet Amethyst Mini Radiant Heart is crowned with a beautiful luminous teardrop shaped & cut Pink Morganite Gemstone. This gorgeous and radiant piece is set into a sterling silver basket setting so that it will lay flat upon the chest hanging from a sterling silver chain. 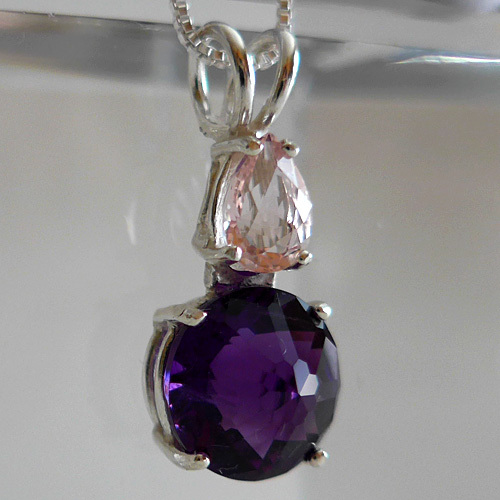 This lovely pendant comes with its own velveteen pendant box for safe keeping. 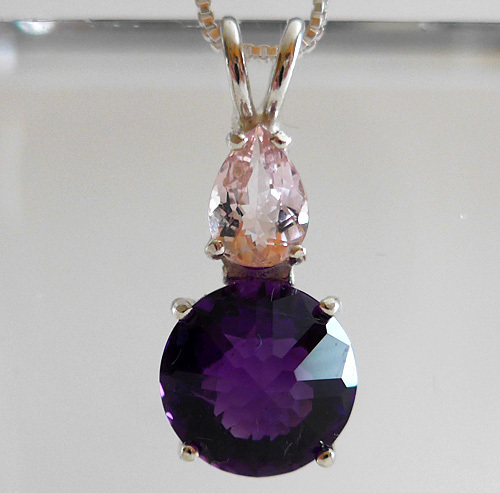 The combination of deep amethyst with the bright rich pink Morganite can assist us in cleansing our auric field, boosting our spiritual connection to Higher Mind and Heart and assist us in smoothing out the obstacles of our daily lives in a heartfelt and deeply connected way. Morganite is especially soothing in a gentle yet poweful way. Note: Weight above is shipping weight. Average weight of this pendant is 4.122 grams. Each piece is unique and may vary slightly in appearance. Each piece is guaranteed to be beautiful and to meet with your complete satisfaction!